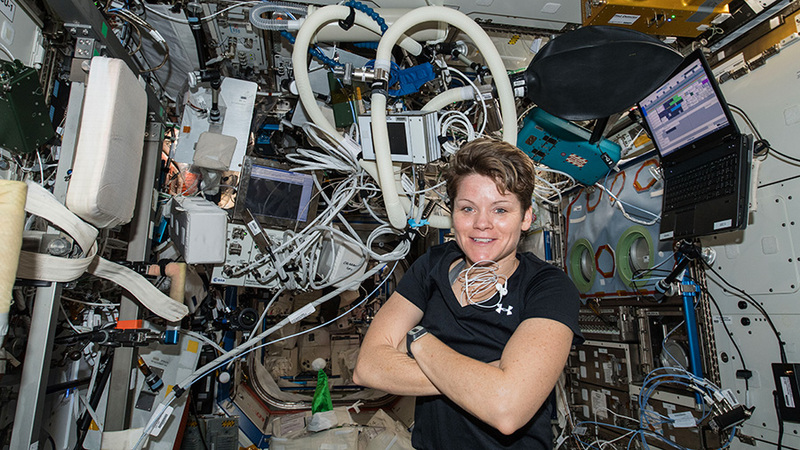 Astronaut Anne McClain is inside the Destiny laboratory module surrounded by exercise gear, including laptop computers and sensors that measure physical exertion and aerobic capacity. The three Expedition 58 crew members continued studying today the upward flow of fluids inside astronauts’ bodies caused by living in space. The crew also worked on packing a U.S. cargo craft and servicing U.S. spacesuits at the International Space Station. One easily recognizable symptom of living in space is the “puffy face” astronauts get due to the upward flow of fluids in the body. Underlying impacts of this phenomenon include head and eye pressure changes that occur off Earth which the Fluid Shifts experiment is seeking to better understand. All three crew members gathered in the Zvezda service module throughout the day using a special suit to temporarily reverse these upward fluid shifts. NASA astronaut Anne McClain wore the Lower Body Negative Pressure suit, which pull fluids downward, while Flight Engineer David Saint-Jacques checked her head and eye pressure using a variety of biomedical devices. Commander Oleg Kononenko assisted the duo with guidance from specialists on the ground. McClain and Saint-Jacques also partnered up before lunchtime to get the Cygnus resupply ship ready for its departure on Feb. 12. The duo reviewed packing procedures and stowed inventory aboard the U.S. space freighter from Northrop Grumman. McClain started the day installing the new Facet Cell crystal growth experiment in the Kibo laboratory module. She spent the rest of the afternoon cleaning cooling loops on U.S. spacesuits in the Quest airlock as NASA prepares for spacewalks at the orbital lab later this year. are the astronauts and doctors sure it is not weight gain that causes the puffiness.. I say this because the earth form of weight gains begin in the face and fat around the waists of people…exercise will have them gain muscle and in the face a slight variation in facial geometric configuration,, water fluids but muscle appropriation the muscle to fat ratios should change.. and as on earth the variance of weight is usually short lived unless food and exercise and rest periods continue or increase appropriately.. The blog linked to in the tweet also provides a link and more details.